This is one of my favorite pictures, taken a few years ago during a trip to London; I took this picture during a cruise through the River Thames on one of those days when the London weather decided to cooperate. That day we discovered that one of the best ways to see London’s famous landmarks, is from the river. As we went past London County Hall, I was duly impressed with the architecture of its building and had to snap this picture. You can see a corner of the London Eye peeking through on the left side as well a ship passing by. This week’s photo challenge: Two subjects. Great photo! I’m going to UK later this year. I can’t wait! 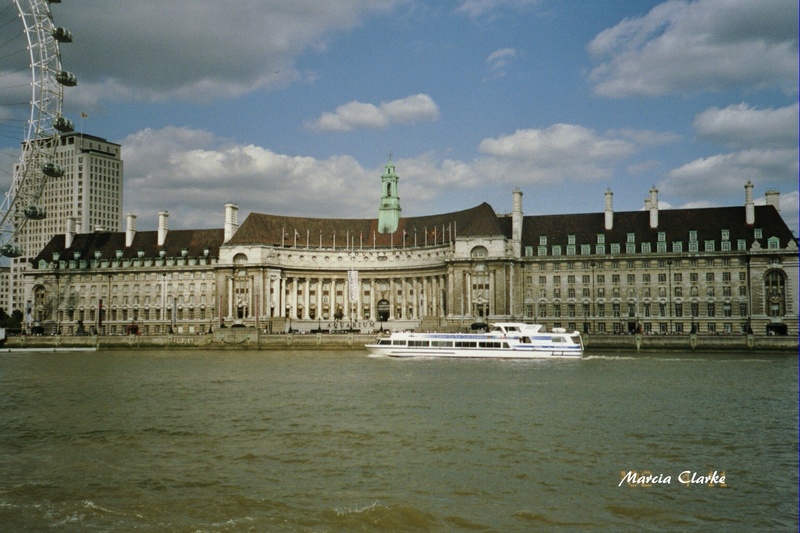 You should definitely do a river cruise along with all other ventures in London. I enjoyed dining at The Crypt’s Cafe in St Martin’s of the Fields church, and listening to beautiful chamber music concerts. I highly recommend it. It is located in Trafalgar Square where you will also find the National Gallery. There is way too much to do in London, never enough time. I want to go back! Magnificent structure with a perfect blue sky. A stunning image, bringing in mind a fun and exciting journey….Thanks. Thanks Madhu, I’m glad I had that photo handy. The more I talk about London and see the pictures, the more I want to go back. You would definitely enjoy the Eye, LOL! I wish I had your memories – and experiences – my friend! Thanks Gilly, glad you stopped by. Thanks Barb. I enjoyed this city so much, it has a permanent spot in my bucket list. Now that I think about it, taking the Eurostar is also a wonderful way to travel within and outside of London. We took it to go to Paris, loved that trip! I completely understand why. I was there once on a two-week college trip, very intense history angle and we could not cover as much as they had planned for us. Still, I saw every one of the must see attractions, and then some! I want to go back, even though I’ve visited a couple of times already. Thanks Meg, that’s a great compliment coming from an expert photographer such as yourself. I am just glad I was able to capture the moment, LOL. Lovely trip and great shot, thanks for sharing .. it’s a very nice place .. dream to be there! Thanks for visiting! I love it there and want to go back again. I was lucky enough to see the same view from the river walk. Fantastic pic, great spot! I think river cruises are the way to go and so much fun. I also got a nice shot of the Eye in another pix. I love London, so much to see and do! Mine too, followed by Paris, Rome and Greece!